A mouse model of RE. In this issue, Carmant and colleagues describe the development of a mouse model of RE, in which peripheral blood mononuclear cells from RE patients are transferred into NSG mice. These RE mice develop seizures following engraftment and exhibit several other hallmarks of RE, including perivascular cuffing and neuroinflammation. 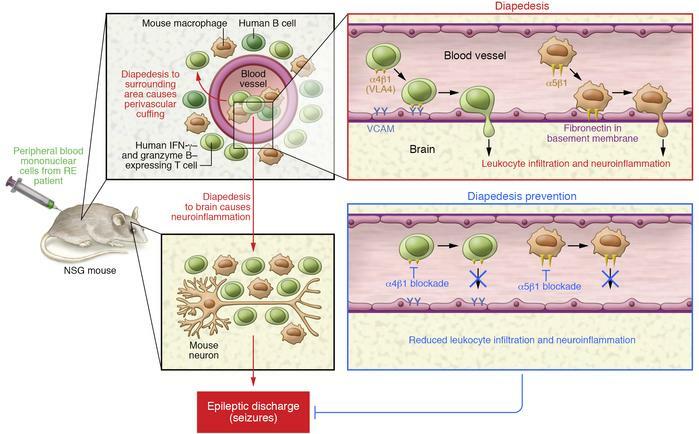 Neuroinflammation is linked to diapedesis of T cells, which is mediated by the interaction of α4β1 on T cells with VCAM on the vascular endothelium, and macrophages, via the interaction of macrophage α65 and fibronectin in the basement membrane. Blocking either α4β1 or α5β1 reduced seizure in this model. Moreover, this model will allow further exploration of potential therapeutic strategies for RE.